Easily lift loads up to 4000 lbs. with this fully featured hydraulic lift table equipped with a 40" x 48" platform and a 2hp 460V motor. 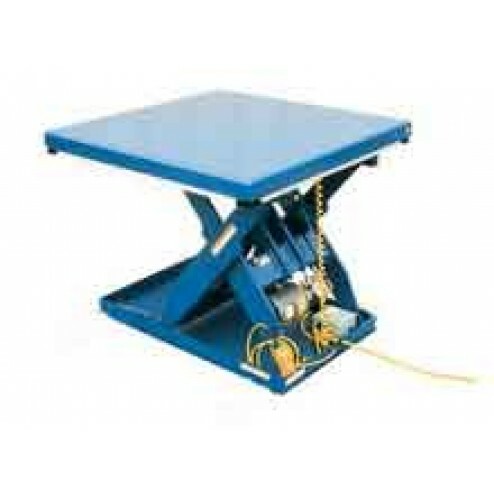 The Vestil EHLT-4048-4-43 Electric Hydraulic Lift Table has a 3000 psi hydraulic component rating. Ideal for all types of manufacturing and warehouse facilities. Platform Size: 40" x 48"
Motor: 2 hp, 460V, 3 phase, 60Hz. Equipped with electric toe guard that will protect pinch points while lowering. 24V fused, push button control with 8" cord. Stop the table at it"s maximum height with the adjustable upper travel limit switch. Platform height maintained with the internal brass velocity fuse. Features an integral maintenance prop.